Surrealism originated in the late 1910s and early '20s as a literary movement. Writers and artists began experimenting with a new mode of expression, automatism, as a way to release the imagination of the subconscious. Visual stories formed on canvas, placing unexpected objects and surroundings together in the same space. 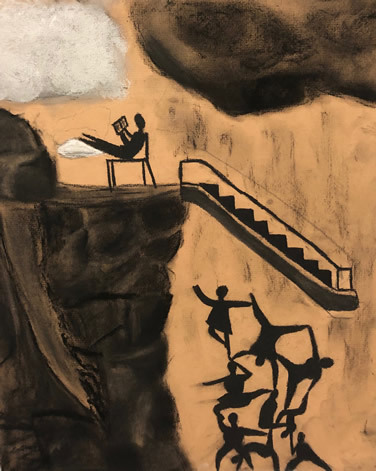 As a member of the global community, Studio Art I students and I discussed ways in which artists can use art to make a statement, share their voice and concerns. 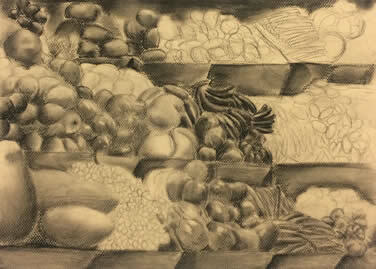 Each student identified a subject of interest and composed a charcoal drawing with in a Surrealist style juxtaposition. Current issues surfaced and students selected many powerful topics: lack of equality in education, water pollution, accessibility to healthy food and produce, and gender discrimination in the workplace. "My image illustrates two very different locations, a school campus and ruins of a city facing war and natural disasters. 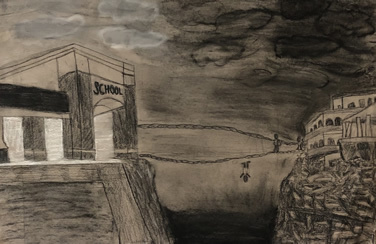 I saw an image on Twitter that was children crossing a rope bridge to get to school in Thailand which inspired me to draw a bridge between the two locations with children crossing it and some falling off. I hope that this shows how hard it can be for some to access education and even how some children do not make it in the process." "This issue is significant to me is because now the vegetables and fruits are decreasing and more people started to get not enough food, and if this issue is not solved in the future, more people will get hungry and it will become a larger problem." "...women have to work harder than men in order to to get to the top, and that because of this we as women must work together in order to get there...the women in the picture are having to climb each other to get to the top and struggling in the storm and rain. Where as the man used an escalator putting in no effort and is just relaxing at the top under the sun." 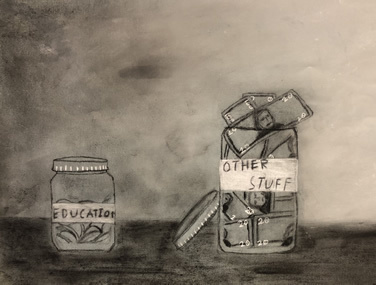 "The purpose of my piece is to shed light on some families neglecting their child's education. The topic, education, is significant to me because I appreciate the education that I have gotten and wish that everyone could have a similar opportunity." These poignant works of art combined perspective, value, form, proportion, realism, proportion and many other drawing skills. I am very proud of the Studio Art I students for accepting this challenge and creating such thoughtful works of art.